Adorable Keiki dolls reflect the sweet children of Hawaii! The word "Keiki" means child in Hawaiian. Keiki Posing miniature dashboard doll is sculpted by an artist and hand painted to detail. Place the doll on your car dashboard and watch her dance. Very cute little Keiki. As described. 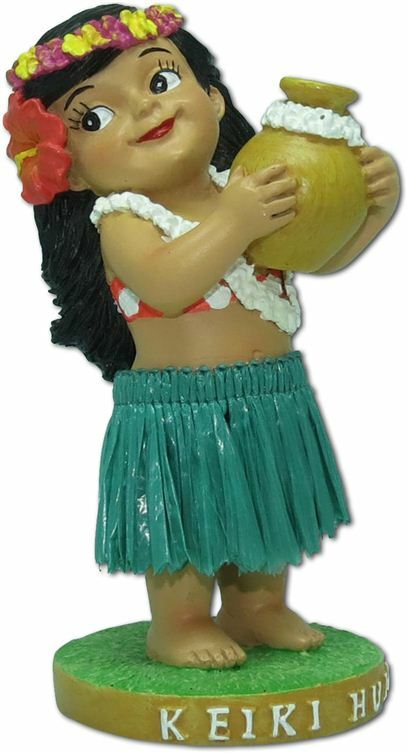 My grandaughter got me the dashboard keiki hula dancer a number of years ago, and, well, that one danced her last omi when her spring gave out! (too many miles maybe?!) I ordered the new Keiki, put her in the car and my grand was very pleased! This is my second one. The first one I purchased in Hawaii and I love it. She brings joy in my driving. I love Hawaii and everything about it.